It tells a story of war, virus outbreak, crazy AI and much more, through encrypted documents, interviews, audio records, schematics, surveillance records, etc. It is a very unique way of telling a story, without going into too much detail about the surroundings, with long and winded descriptions. The story is mostly dynamic, however the first 100, maybe 150 pages is quite confusing. It was my first time reading a novel written in such a way and so I found it difficult to wrap my head around what is actually going on. However once I caught up with it, and learned how to read it, it was a fast paced, addictive story. I adore Kady and Ezra, they are captivating, well developed characters, it is so easy to fall for them. Kady is a flawed, sassy girl who shows bravery and intelligence in difficult times, when her home planet is invaded and she looses everyone she cares about. Ezra is a sweetheart who learns how to fight tooth and nail for something and someone he loves. But even thou I liked them both separately, I didn’t think the romance between the two was necessary to the extent it was present at, simply put – there was too much of it. I think that it contributed to the story feeling so pro-longed, like certain chapters could be left out and the book would benefit from being shorter. Overall I really enjoyed the read and I recommend it to anyone who is interested in reading YA Science Fiction genre. I was debating for quite a while actually, whether this novel deserves five stars but I decided against it and instead I settled for solid 4 stars. -In its uniqueness it was difficult to read as it was, all the long numbers, skewed text, at some points you physically have to turn the book around 360 degrees to make sure you have included everything. -The novel blacked out curse words, and there were so many of them that I felt like they either shouldn’t have been blacked out at all or there shouldn’t have been as many of them. Even thou you could assume what the words would be, it was irksome to have to do that so often. 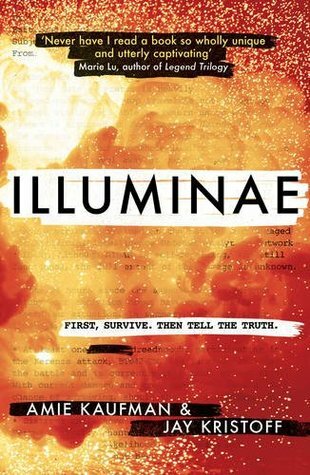 I am really looking forward to read the Illuminae #2, Gemina, I’ll be sure to include it in my next book haul. That’s it for this review, thank you for reading and until next time, Dream On, Dreamers! That’s true, they are very uniquely written and the story is amazing!